There was this fantastic “hole in the wall” restaurant we used to go to in the city where I used to live, where the food was worth dying for. It was a very small restaurant but very popular because of the food being lip-smacking good. Everything was prepared right in front of you. They had the Tandoor oven right in front of the restaurant where the cook would make amazing Naan and Tandoori Roti. He would take a ball of flour and roll the Naan with both his hands – like he was clapping, with the flour in between his two hands. Once it attained the requisite shape, he would take a folded wet kitchen towel, place the Naan on the towel and with his hands place the Naan on the side of a very very hot Tandoor oven! After a few minutes, the Naan would fall off the side, which would then be taken out of the oven with a long metal rod and placed right on a plate to be eaten! Yum. Nothing like eating a hot Naan with a really spicy Dal (lentil cooked in spices in a clay pot and topped with fresh herbs and deep fried thin onion strips and green chilli). The food cooked in a clay pot just has a fantastic taste and very rustic feel to it. When I used to visit my grandma in the village she used to live in, she would make hot rotis (very thin wheat flour breads cooked on a hot pan) topped with little ghee, spicy dal accompanied with a vegetable dish all cooked in clay pots on a wood burning stove. The food was unbelievably good! It was simple, wholesome and really tasty made with ingredients from the organic farm that they used to own. They made fresh home made ghee with a hot cup of chai from the milk of the cow that they owned. There is nothing like eating pure and tasty food grown with all organic ingredients with no genetic modifications whatsoever and local. In case you are wondering what Naan, Tandoori roti and Tandoor oven are, here is a brief explanation. Naan is a type of soft Indian bread made with white flour and cooked in an oven. It can be made either plain topped with a little ghee or with various other toppings like garlic, onion, stuffed with potatoes and spices etc. Tandoori roti is made with wheat flour and cooked in an oven and is slightly crusty. Both the Naan and Roti are slightly thicker in texture. A Tandoor oven is a type oven that is usually half way under the ground with a open face where it is heated using wood. It’s walls are made of clay on which the Naan’s and Tandoori Rotis are stuck on to be cooked. The temperature of the oven is really hot ranging anywhere from 500 – 700 degrees F.
So where was I? Oh yes, I was talking about the restaurant we used to go to. Sorry about the digression but I was suddenly nostalgic and my fingers did the typing as my brain took control of them with memories from the past. 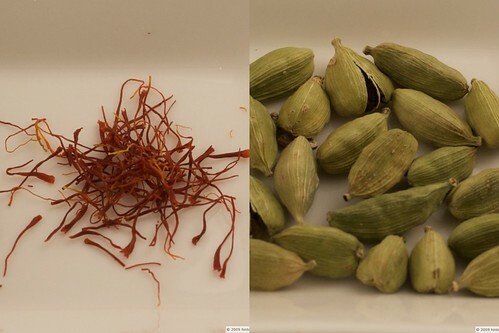 Another thing I would have at the restaurant is Almond and Pisaschio milk with Saffron threads. The milk would be heated on low heat in this huge karai (or wok) that would constantly be stirred with a long flat spoon. Due to the long cooking time, the milk would get slightly thicker. 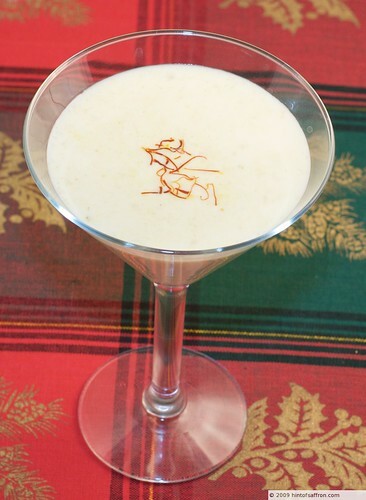 Soaked almonds were ground along with pistaschio, sugar and saffron threads and were added to the milk. 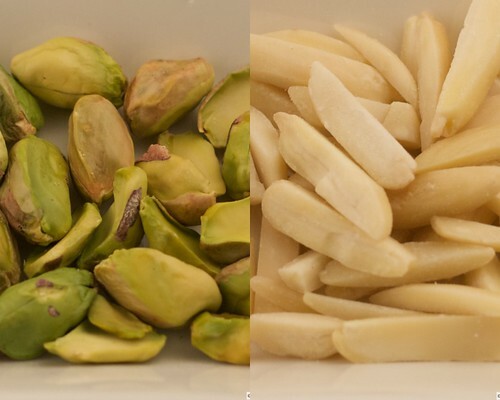 You can pre-soak the almonds, grind them and add grounded pistachios and store in a air tight container in the freezer. That way, you only have to heat the milk, add the almond, pistachio powder, sugar, cardamom and a few crushed saffron threads and drink! Take a cup of warm water and add slivered almonds. Let is soak until the milk is ready to be used approximately 45 minutes or so. Heat the milk in a medium saucepan and bring the milk to a boil. Turn the heat to low and cook the milk until the milk is reduced to 2 cups, approximately 45 minutes. Occasionally, stir the milk and scrape the sides of the saucepan. Grind the almonds in a food processor and then add the pistachio and sugar. Add a 1/4 cup of water to help with the process. 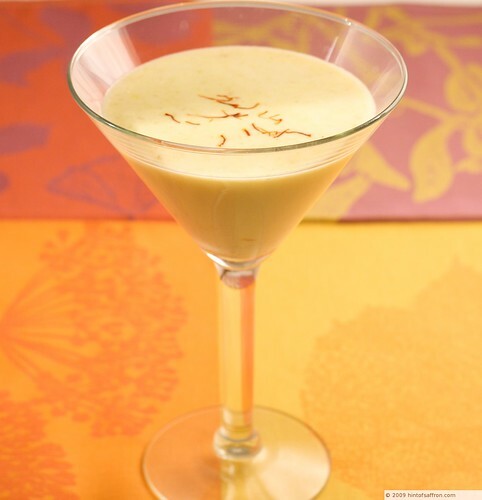 Once the milk has reached the desired consistency, add the almond, pistachio mixture, saffron and cardamom to the milk and let it cook for a few more minutes.